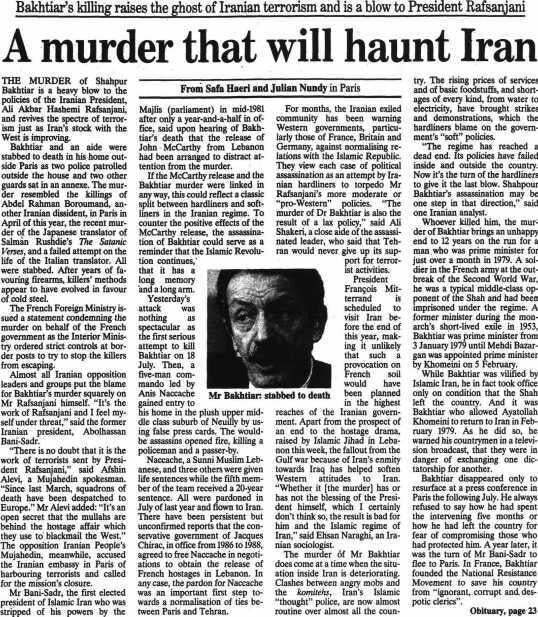 On 9 August 1991, The Independent ran a news story headlined, “A murder that will haunt Iran” – Shapour Bakhtiar was stabbed to death by three terrorists using knives from the kitchen of his home in France. Fingers were pointed at Tehran. “While Bakhtiar was vilified by Islamic Iran, he in face took office online,” the report said. “He in fact took office only on condition that the shah left the country. And it was Bakhtiar who allowed Ayatollah Khomeini to return to Iran in February 1979. 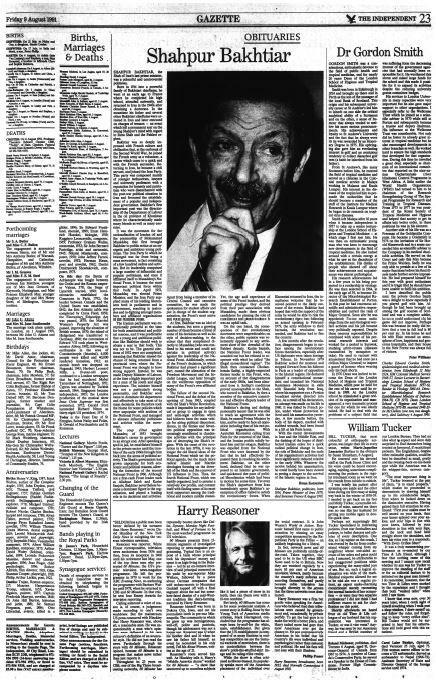 As he did so, he warned his country men in a television broadcast, that they were in danger of exchanging one dictatorship for another.” Bakhtiar’s obituary follows. Shapour Bakhtiar, the prime minister of the last shah of Iran, was a colourful and controversial politician. Born in 1914 into a powerful family of Bakhtiari chieftains, he went at an early age to France where he completed his high school, attended university, and returned to Iran in the 1940s after obtaining a doctorate. In the meantime his father and several other Bakhtiari chieftains were arrested in Iran and later executed on charges of treason – an event that left a permanent scar on the young Shapour’s mind with regard to Rem Shah and the Pahlavi regime. Bakhtiar was so deeply impressed with French culture and civilisation that, at the outbreak of the Second World War, he joined the French army as a volunteer, a career which came to a quick end with the French surrender. Returning to Iran, he became a civil servant, and joined the Iran Party. This party was composed mainly of younger technocrats, lawyers and university professors with a reputation for honesty and patriotism who were disenchanted with the post-war political situation in Iran and favoured the establishment of a popular and independent government. Bakhtiar’s first important post was the director of the Department of Labour in the oil province of Khuzistan where he characteristically made many friends as well as many enemies. It was the movement for the nationalisation of Iranian oil and the premiership of Mohammad Mossadeq that first brought Bakhtiar to public notice as an energetic and ambitious young politician. The Iran Party to which he belonged was far from being a mass movement, in fact consisting of a few hundred cadres and activists. But its leadership comprised a large number of influential and popular politicians, and once it affiliated itself to Mossadeq’s National Front, it became the most important political force within that body. In April 1951, Mossadeq was elected prime minister, and the Iran Party supplied many of his leading lieutenants both in parliament and government, resulting in jealousies and infighting among members and affiliated organisations of the National Front. The Iranian parliament was exceptionally powerful at the time for both constitutional and political reasons, and it was predictable that a young and ambitious politician like Bakhtiar should wish to obtain a seat in that body. This was not to be. The general elections of 1952 were not completed, meaning that Bakhtiar missed the chance of being returned from a provincial town where the National Front was thought to have strong support. Instead, he was made deputy minister of labour, at the time a highly important post for a man of his youth and slight experience. The minister himself was not a particularly strong personality, and Bakhtiar soon came to dominate the department and effectively to take most of its main decisions. He therefore took the blame for some policies which were unpopular with sections of the National Front, and managed to alienate influential politicians and activists within the movement. The coup d’detat against Mossadeq of 1953 brought Bakhtiar’s career in government to an abrupt end. After spending a spell in jail, he established himself in the private sector until the troubles of the early 1960s brought him back into the arena of political activity. The shah’s government had grown unpopular for both economic and political reasons, allowing the formation of the second National Front in 1960. Although not a first rank Front leader such as Allahyar Saleh and Karim Sanjabi, Bakhtiar nevertheless became a dominant figure in the organisation, and played a leading role in its decisions and activities. Apart from being a member of its central council and executive committee, he was made the spokesman for student affairs and put in charge of the student organisation, the Front’s most active and vocal group. At first, Bakhtiar was an idol of the students, but soon a growing number of them became critical of some of his decisions as well as his style of decision-making, to the extent that they complained directly to Mossadeq (who was confined to his estate and could not partake in political activity) against the leadership of the National Front. Additionally, certain of the Front’s decisions, in which Bakhtiar had played a significant part, caused the alienation of the Freedom Movement and the Socialist League, and later brought on the vociferous opposition of many of the Front’s own affiliated bodies. The failure of the second National Front, and the defeat of the uprising of June 1963, coupled with the shah’s White Revolution, made it impossible for any individual or group to engage in open and semi-legal activities which had hitherto been the main vehicle for airing political discontent. Hence, in the Sixties and Seventies political opposition was increasingly manifested in clandestine activities with the principal aim of destroying the shah’s regime. With the onset of the revolution in the late 1970s, it was no longer the old liberal ideas of the National Front which set the political agenda, but the much more radical Islamic and Marxist ideologies focusing on the downfall of the shah and the removal of US influence in Iran. Thus, the fourth National Front, which was hastily organised, had to assume a relatively low profile, and content itself with finding some of its most loyal supporters among the traditional and modern middle classes. Yet, the age and experience of some of the Front leaders, and the political prestige they derived from their past association with Mossadeq, made them obvious candidates for playing the role of conciliators and peacebrokers. It was an uphill task. On the one hand, the consequences of the revolutionary movement were unpredictable; on the other, public opinion was vehemently opposed to any settlement short of the downfall of the Pahlavi dynasty. Karim Sanjabi, the National Front leader, was sounded out but he refused to cooperate with what he called “the illegal monarchical regime”. The shah then contacted Gholam Hussain Sadiqi, a highly-respected former leader in the Front, who, on account of the disagreements of the early 1960s, had been alienated from it. Sadiqi’s conditions proved unacceptable to the shah, who turned to Bakhtiar, by then a member of the executive committee and effective deputy leader of the National Front. Bakhtiar’s daring and dashing personality meant that he was able to reach an agreement with the shah, be named prime minister by him, and be ready to face all opposition including that of his own political organisation. With Ayatollah Khomeini calling from Paris for the removal of the shah, and the Iranian public solidly behind him and his slogan, Bakhtiar was expelled from the National Front, who were incensed by the fact that he had effectively bypassed them in reaching his settlement. Bakhtiar, on the other hand, declared that he was opposed to an Islamic government, and quickened the pace of political liberalisation which had been in motion for some time. Yet even the shah’s departure from Iran immediately upon Bakhtiar’s assumption of office failed to satisfy the revolutionary forces. When Khomeini returned to Iran, the tumultuous welcome that he received pointed to the likely outcome of the events. Bakhtiar had hoped that with the support of the army he would be able to ride the revolutionary tiger, but, following an armed uprising in February 1979, the army withdrew to their barracks, the revolution succeeded, and Bakhtiar had to flee the country. A few months after the revolution, disagreements began to surface among the revolutionary forces themselves, especially after US diplomats were taken hostage in Tehran. In November 1979 Bakhtiar seized the moment and stepped forward from his hideout in Paris as a leader of opposition to the Islamic regime. He declared himself a constitutional monarchist and launched his National Resistance Movement in exile with financial help from Iraq, where his supporters ran a Persian broadcast service directed into Iran. As a result of his declaration, an attempt was made on his life in 1980. It was foiled by French police, under whose protection he lived until his assassination yesterday. A few months before, the body of his deputy, marked with stabbed wounds, had been found in a lift at his Paris home. With the recent developments in Iran and the Middle East, and the dashing of the hopes of disaffected Iranian exiles for a quick radical political change in Iran, the role of Bakhtiar and the wale of his organisation’s activities had been significantly reduced relative to the early 1980s. Whatever the motive behind his assassination, he could hardly have been viewed as posing a danger to the survival of the Islamic regime in Iran. Shapour Bakhtiar, politician, born 1914, prime minister of Iran 1979, died Suresnes, France, 6 August 1991.